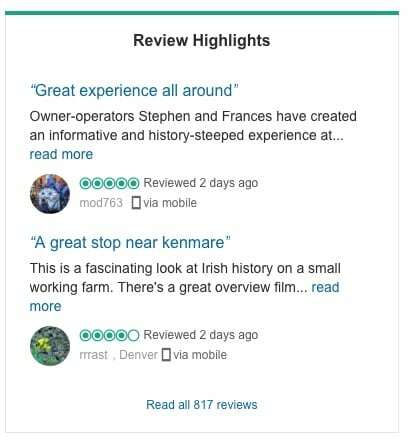 Molly Gallivan’s is opened from 9.30am – 6pm, 7 days a week from Mid-March to Mid-November and is opened all year round for pre-booked Tour Groups. You can call and visit Molly Gallivans without advanced booking from 9.30am – 6pm, 7 days a week from Mid-March to Mid-November. If you wish to visit one of our Traditional Irish Evenings or Restaurant pre-booking is necessary please email info@mollygallivans.com for further information. Pre-Booking is also necessary for Tour Groups requiring guided tours of Molly Gallivans. We do not host Traditional Irish evenings every night of the week. The nights that they are held vary week from week. It is best to email us at info@mollygallivans.com with the dates of your travel and we can let you know what nights we would have available for you. I saw an item in Molly Gallivans but I cannot see it online, how do I purchase it? At present not all items for sale in Molly Gallivans are available online. If you saw something that you would like to purchase but cannot see it online please send us an email to: info@mollygallivans.com with a description and quantity and we try our best to get the item to you. We try to process orders as quickly as possible and if your item is in stock you will usually receive it within 10 days. We will always try our best to get the item in for you as quickly as possible. Very occasionally we may have to contact you to ask if you will accept an alternative colour or style but you will always be contacted before we make any changes to your order. If your card has been declined and the order cannot be completed please do not worry. It can be common procedure within some banks to block international transactions to protect your credit card security. If you are receiving an error message when entering your billing address please check that the address you are entering is an exact match for the address that your bank has on file. Please review your address carefully and ensure that there are no typing errors. Yes we can send it as a gift for you directly to the recipient. Just enter the address for the recipient as the shipping and we will send it directly to them. If you forgot to add something to your order do you not worry. Please call us as soon as possible on +353 87 2433894 and we can take the card payment over the phone and add the item to your order. Or you can simply order it online. If there are any problems with the items you can return them to us as long as they are in their original condition with tags attached, either for exchange or refund within 30 days of receipt. Please email us at info@mollygallivans.com before returning any items to us. What are the taxes for orders to an address outside of Europe? Any taxes and/or duties on your order are not included in your online total. You may be charged local duties by customs in your country. Please contact your local customs office for more information regarding these charges. When you place an order you should receive a confirmation email. If you do not receive an email confirmation then contact us at info@mollygallivans.com with the details of the order. How do I care for my Aran product? Aran woollen products are made of natural fibre, they are breathable and they do not require to be washed as often as other products do. Air your Aran frequently and wash when it is necessary. It requires hand washing with a wool detergent, and dried flat. It is possible to dry-clean your Aran but make sure your cleaners check the care labels first. DO NOT put your Aran in the tumble dryer. How do I care for my tweed and linen purchases? Tweed and linen Purchases are suitable for dry cleaning only.